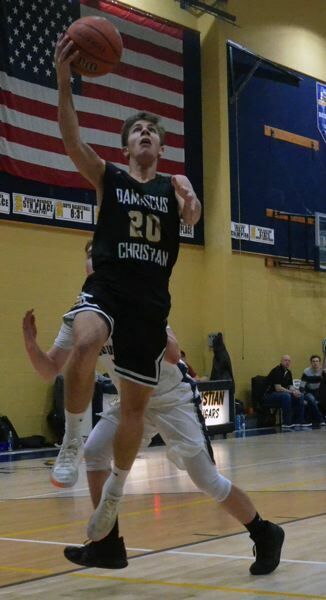 The Damascus Christian boys basketball team relied on its defense to carry it past County Christian 64-34 in Tuesday's Valley 10 league opener. The Eagles took off late in the first quarter, scoring four uncontested baskets on their way to an early 17-9 lead. "Fortunately, some of our shots were falling, that always helps," Damascus coach Brad Patrick said. "But also just being in an attack mode. I think that if we execute well, then we have a couple of kids that can get to the rim quickly." The Cougars were held to eight points in the third quarter, as Damascus had them doubled up on the scoreboard 52-26 heading into the fourth. "A lot of good ball movement out there, a lot of driving and kicking out. Ball reversals were what got us good shots and good drives," Damascus Christian's Jason Budey said. Damascus put up 18 points from six different scorers, with two baskets apiece from Johnathan Shields and Jacob Zakharyuk. "I think that was one of our better games so far, granted it's only the third game of the season. But our execution was much better tonight," Patrick said. Damascus Christian takes on Horizon Christian out of Hood River on Friday. • The Damascus Christian girls suffered their first loss 55-34 in a season-opener that could carry Valley 10 title implications through the course of the season. Country dominated from the opening tip, scoring the game's first five buckets and ending the first quarter fully in charge 22-1. "We were down by about 20, they outplayed us," Damascus coach Dave Wakefield said. "We looked like freshmen and sophomores, which we are. I have one junior and one senior. That was not the way you wanted to start." Damascus Christian outscored the Cougars by a point in the second period, but the damage had already been done. A comeback too far out of reach. Damascus center Tory Webb came up with seven of her team-high 12 points in the third quarter, but the Eagles were only trading baskets unable to gain any ground. Damascus kept up the scoring touch in the fourth with Webb and Savannah Hale combining to knock down four consecutive shots. "We were actually pretty even in the last three quarters," Wakefield said. "If we would have come out with the same fire in the first quarter, we might have been okay."